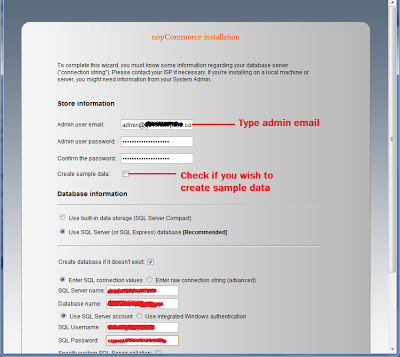 How to Create NopCommerce Site on Shared Hosting? Today, I will show you how to deploy nopCommerce on Shared Hosting. I will be using HostForLIFE.eu web hosting as my Shared Hosting but you may use other hosting provider. If you have set your "Nameserver" pointing to your third party hosting, please do so now. Setting up "NameServer" can take upto few minutes to few hours so do it while you are trying to prepare for next few steps. Let say you purchase your domain on "HostForLIFE.eu", in order for HostForLIFE to point to third party hosting you need to set up nameserver. Login into your "HostForLIFE.eu" domain account and goto "Domain Details" page of your domain. Inside "Domain Details" find "NameServers" and click on link "Set Nameservers". Then, On Nameservers popup window, choose the option "I have specific nameservers for my domains." 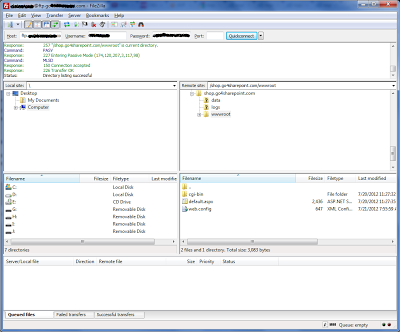 Type Nameservers details you received from your hosting company. If you do not have call up your hosting company and find those details. You need to set "Nameserver " and "Nameserver 2" details and other if you have any more servers. Click "OK" button to save Nameservers changes. Now This may take few minutes to few hours in order to have changes in effect. Creating Domain and Website inside third party hosting. Logon to your Plesk Control panel. Create a Domain inside control panel. First, You must Click on "Domains", then click button "Add Domain" to add new domain. You need to typein your domain name and click "Add". Create a website inside Plesk control panel. Click on "Websites" and click button "Add Website" to add new website. Compile the project in Release Mode. Publish website. 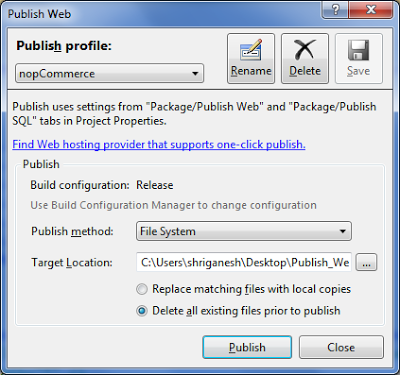 From menu, Build > Publish NopCommerce site. Save publish profile as shown in figure below and click on "Publish" button. After few minutes, website will be published and create necessary files in folder you choose to publish. 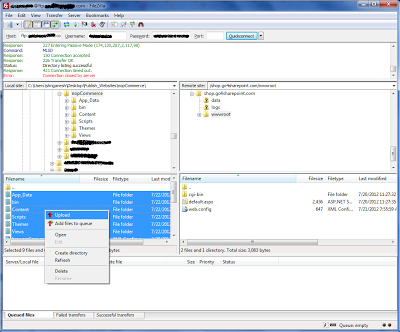 Open FTP Client tool FileZilla. If you do not have installed FileZilla FTP software or any other FTP Client Software, please do so before proceeding any further. 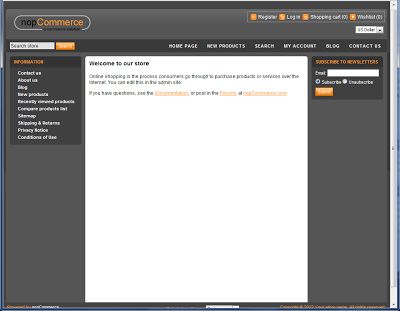 Now Copy files you just published for "nopCommerce" to Remote Site. Since we are doing it for first time we have publish all files, but if you are doing it after your first installation remember to remove your configuration files. Now type the URL of your website and "nopCommerce" is smart enough to help you through your first time installation, even in third party hosting. After few minutes you are ready with your e-Commerce website.